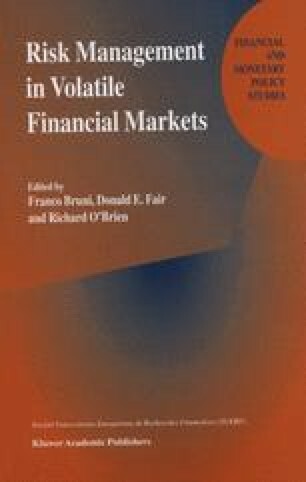 The paper argues that risk exposure of the financial system is mainly due to a lack of risk matching of assets and liabilities in traditional banking rather than the development of new financial markets and instruments. Increased competition between financial institutions has reduced the ability of banks to withstand undiversifiable risks from interest rate changes and macroeconomic developments. New instruments can help to improve the situation by taking these risks off the banks’ accounts. However the correlation of explicit risks with counterparty risks in risk-shifting arrangements may make it difficult to assess the effectiveness of such arrangements. The problem is compounded by the fact that counterparty risk may depend on the entire network of inter-institution contracts which varies as time goes on. The paper suggests that, to a first approximation, a proper view of the risk exposure of the overall financial system can be obtained from a consolidated set of accounts which net out all inter-institution positions. As yet though, the fragmentation of regulatory and reporting systems precludes such a consolidation of accounts. I am grateful for the hospitality of Harvard University where this paper was written. I am also grateful for many stimulating discussions with Niklaus Blattner, Jürg Blum, Thomas Gehrig, Hans Gersbach, and Elu von Thadden. Finally, I am grateful for research support from the Schweizerischer Nationalfonds, the WWZ at the University of Basle, and the Taussig Chair at Harvard University.